Jones, Peter, and Miles, Debra (2012) Reaching out to the region: developing a blended pedagogy for social work education at a distance. In: Peterson, J., Lee, O., Islam, T., and Piscioneri, M., (eds.) 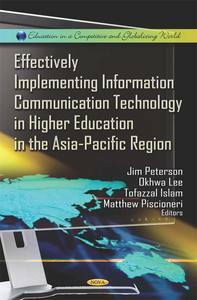 Effectively Implementing Information Communication Technology in Higher Education in the Asia-Pacific Region. Nova Science Publishers, New York, NY, USA, pp. 247-263. The nature of social work education has always presented challenges for the effective delivery of programs at a distance. The development of skills in areas such as interpersonal communication and therapeutic groupwork did not lend themselves to the first generation of print-based approaches to distance education, while opportunities to engage with others and develop skills for dialogue and critical reflection were unavailable to the isolated student reliant on print materials. However, the rapid emergence and development of web-based technologies suggests new possibilities for education that not only provide solutions to these challenges but which address key social justice issues such as access and equity in higher education. In particular, Web 2.0 applications that allow for greater interactivity and collaboration have transformed the nature of distance teaching. In this chapter the authors trace the development of approaches to distance education in a social work course based in Northern Australia. This narrative describes the movement from an exclusive reliance on face-to-face teaching to the incorporation of a print-based distance education approach and then on towards a model that integrates these with online methodologies that provide for networking and collaboration. The chapter draws on student feedback about this model and describes the benefits and challenges identified by students. This engagement with the challenges and opportunities presented by emerging technologies has resulted in an approach to teaching social work that represents a truly 'blended' pedagogy. This model has allowed the course to more effectively extend its student catchment into the Asia-Pacific region, creating new opportunities for access to social work education for students in this region.